Advanced has been appointed to serve as a Microsoft Surface Hub Partner Reseller and is authorized to immediately begin designing, installing, and servicing Surface Hub solutions for all of its Canadian customers. According to Weatherhead, Advanced has installed a Surface Hub system as part of its upgraded, state-of-the-art collaboration experience in its executive briefing center. 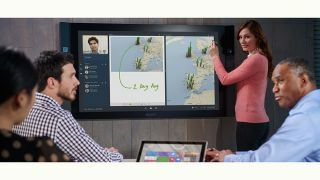 Connected to complementary AV components, the new collaboration experience is designed to fully showcase the capabilities of the Microsoft Surface Hub in a real-world environment.